I wanted to make my daughter an Elmo cake for her first birthday. I browsed online at photos of amazing cakes but never saw one that caught my eye. 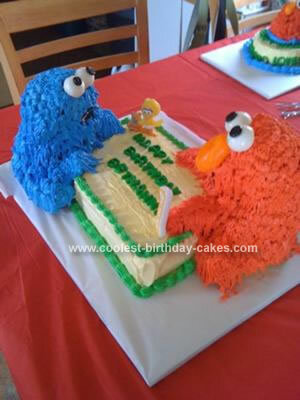 I saw similar cakes that just stood with an Elmo using Wilton standing bear cake pan. Then I came across a cake that had two characters.It was a HUGE cake and I knew I didn’t want one that large so I browsed on eBay and found the cake pans and I also saw a miniature cake pan I thought would be perfect for her smash cake. I used a total of 5 box cake mixes for this, and 5 boxes of the whipped frosting from Wilton. I used the Wilton bear mold (standing) for both Elmo and cookie monster. For the cake in the middle I baked a half sheet cake and cut it in half then stacked it on top of the other. I also put the cakes in the freezer to harden so I could cut off the ears from the bear. I held up the pan to the corners of the cake and cut off at a diagonal each end so that Elmo and cookie monster would be flat up against the cake. I used the pieces I cut off to form arms for Elmo and Cookie Monster. Then I froze them overnight to get firm so I could frost them. I used Wilton red and blue color and also the whipped frosting from Wilton that you mix with just ice water. Tastes very good and easy to work with. I used the grass tip for the fur and fondant (I used Wilton coloring for that too) for the eyes and Elmo’s nose and the letters using miniature cookie cutters from Walmart. This homemade Elmo and Cookie Monster birthday cake turned out very well and I was very pleased with the results. I had 7 people here (Adults) and had over half the cake left if not more. Feeds a lot of people. So sorry I didn’t see the comment. I was moving to the south..I used the 3D bear pans for Elmo and cookie monster but cut off the ears. I found the pans on Ebay and also the mini bear for the smash cake.